Have you ever gotten a text message that is obvious spam, and it’s asking you to reply STOP to cancel, but you’re hesitant to do so knowing that you may confirm your identity to the spammer? We’ll show you how not only to stop text message scam from coming through, but how to prevent your wireless account from being charged a monthly fee, how to report these numbers to your phone provider, and how to be reimbursed for the text charges themselves. Here’s an example of a text message scam you may receive. The sender may be listed as a full phone number, or as an SMS Short Code. Each day, more than $40 Trillion Dollars changes hands worldwide. Reply STOP to Cancel For HELP call 18888906150. This particular example came from the SMS Short Code 707-65. An SMS Short Code is an abbreviated number, or alias, used for SMS (text) messages. While scam text messages are nothing new, they are picking up in numbers lately. Here’s how to avoid getting scammed. How Do Text Spammers Make Money? The first thing you’ll want to do is reply STOP to the text message. I know in the email world this is not the best idea, because it will confirm your identity to the spammer (it’s best to simply ignore email spam), but in the texting world, especially if your sender is using a Short Code number to send from, there is in fact a system in place that will stop the texts from that number, as well as prevent a recurring charge from being added to your account. If you don’t reply STOP, you may well end up with a recurring monthly charge on your account. The way these services work is that they offer you a “trial” service, which really is just a regular text message loaded with some useless junk, and they then attempt to charge you if you don’t cancel (i.e. reply STOP). With AT&T, at least, this is how the process works. This may differ based on your provider. The worst part is that the recurring charges are very difficult to spot on your bill, so you may well end up paying the $9.99/ month extra for months without realizing you’re being scammed. If you’re with AT&T, here’s how to spot the scam charges. 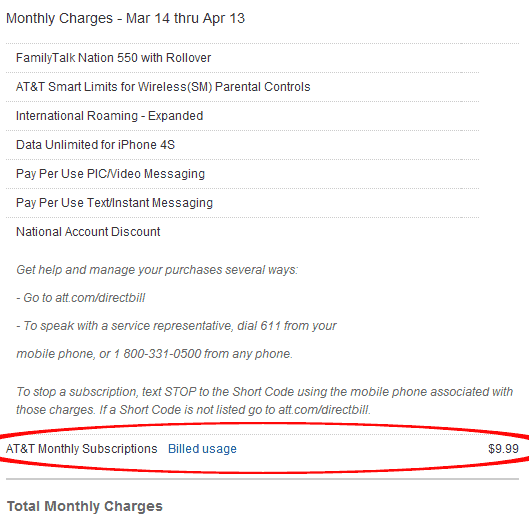 Here you can see the line item AT&T Monthly Subscriptions towards the bottom. You’ll notice that they preface the billing with the notice To stop a subscription, text STOP to the Short Code using the mobile phone associated with those charges. 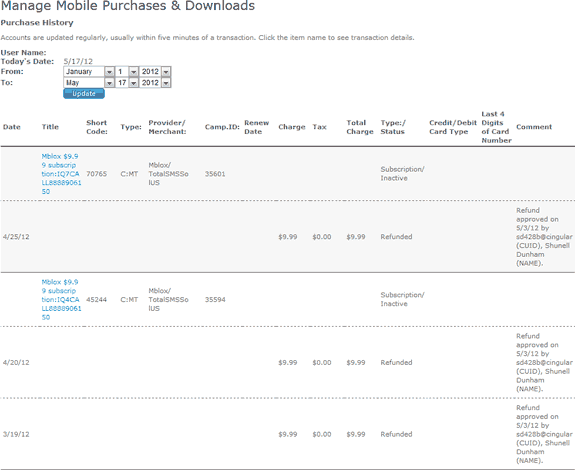 If a Short Code is not listed go to att.com/directbill. ‘This, in addition to what we’ve heard speaking to AT&T reps, confirms the widespread nature of these SMS Short Code texting scams. You’ll see here that the “content provider” (ie. scam artist) is ‘TotalSMSSolUS‘. We’ve had to call in to AT&T and have multiple instances of these charges by various providers canceled and refunded. This one, ironically, showed up shortly after we had done the digging into this issue for this article. As you’ll see in the description, you can visit att.com/mobilepurchases to learn all about mobile purchases and how they work. To actually cancel and dispute these charges, either call AT&T or visit this page: att.com/db. By doing so, you’ll be taken to a page that asks you to input your cell phone number. You’ll also be asked to enter an 8-digit security code that will be sent to your mobile phone via free text. If you click on the title of a subscription, you’ll be given details as well as a link where you can dispute the charge. At the time of this writing, the link did not work for us (resulted in a red error message on the screen), so we called in to dispute the charge. These Charges Don’t Seem Fair? We agree. Our main problem with these cramming charges is that the phone provider (in this case AT&T) gets a portion of the profits. The FTC didn’t like this tactic either. On October 8th, 2014, AT&T settled claims with the FTC for customers billed for these SMS scams for $105 million. Charges will now be disabled by default, and a customer will have to specifically opt in to get charged. While calling in to report your existing unsolicited monthly mobile subscriptions, there’s a couple things you can do to prevent monthly test message scam charges from recurring. The first is to add a purchase block to your account, which will prevent any of these unauthorized purchases from going through to begin with. While this will take care of the monthly subscription charges, it will not reimburse you for the text message spam you receive (and are charged for by your wireless provider if you’re not paying for an unlimited texting plan). ATT FREE MSG: Thanks for providing us with the content of an unwanted message. Now, reply with the sender’s phone number so we know who sent you this message. Reply with either the full number or Short Code of the sender. Once you do so, not only will AT&T be notified and be able to take action against this scammer, they will also reimburse your account for this message so you won’t be charged for it. What are the US Laws Regarding Text Message Spam? A growing concern for mobile phone users is the rise in text message spam over the last few years. These unwanted messages are both annoying and time consuming. In some cases they can even be intrusive and time consuming. What many consumers and mobile phone users may not realize is that the USA does have some fairly significant laws which are aimed at preventing the proliferation of unwanted text messages (just like unsolicited commercial emails). What are the Current Text Message Spam Laws in the USA? Believe it or not, the CAN-Spam Act of 2003 actually was the first major legislation aimed at text message spam along with email. This law made it illegal to send unwanted commercial email messages to wireless devices without prior permission. This ban has been in effect since 2005. This ban applies to all commercial messages, which are defined as messages whose primary purpose is to advertise or promote a commercial product or service. Additional FCC rules and requirements prohibit the sending of unwanted text messages under certain conditions. One of the most prominent of these is that it is illegal to send unwanted text messages from an auto-dialer. It should also be understood that these laws do not cover transactional or relationship types of messages. That simply means that if it is a company which already has a relationship with their customers, they are able to send things like statements or warranty information. Noncommercial messages are not covered. This could mean election or candidate surveys or fundraising messages. The do not call list is a database of phone numbers which telemarketers are prohibited from calling unless they have an established business relationship or are exempt (due to another reason). The FCC also prohibits sending unwanted text messages to a wireless phone that has been placed on this list. As far as the prior consent, or express prior authorization, there are further conditions. This authorization may be provided (or requested) either orally or in writing. They must also state the name of the entity that will be sending the messages and the name of the entity actually advertising the products (if different). 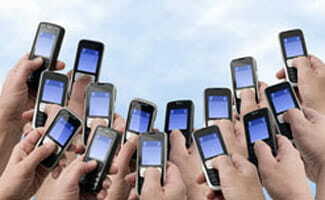 Several publicized cases of text message spam between 2008 and 2010 resulted in the violators agreeing to settlements. The recipients of the spam messages were compensated with between 150 and 175 dollars each. Additionally, several FCC rulings reiterate the right that recipients have to take offenders to small claims court. The victims may collect a minimum of 1 dollar per spam text message received. According to much of the studies and research, it seems that many mobile phone users are not even aware of these laws which can help protect them from text message spam. If this contention is correct, then none of these laws will really have much of an effect. If consumers and mobile phone users do not even know what a violation is, they likely will have no idea who to report violations to and nothing will happen. Then again, if spammers begin to realize this situation and start sending more text message spam, then it could create a backlash. As consumer outrage grows, maybe more attention will be generated towards this problem. The attention will lead to more awareness and potential even a strengthening of the existing laws (or new laws entirely). Then, mobile users will better understand exactly what the laws are and the landscape of text message spam will begin to finally change. Until this point is reached, spam text message marketers will likely continue their ways undisturbed. Text message spam will not only continue unabated, but will probably even increase, perhaps dramatically. The situation will become more and more intrusive. Of course, these laws should serve to curtail the activities of spammers and protect the privacy of mobile phone users. Yet, this is not likely to occur until awareness reaches a much higher level. In the meantime, spammers will continue to find more and more ways to reach the phones of users. The messages will advertise a wider range of products and services as well. Another interesting angle with this situation to consider is that of app creators and providers. It is possible that apps may be created on both sides of the fence. In other words, some will make it easier for spammers to operate, while others will make it easier for concerned users to protect their privacy. For those who aware of the situation right now, there are a number of steps which can be taken to help protect privacy. Putting a wireless number on the Do Not Call list is a start. Of course, consider only giving out the number very sparingly. If an unwanted message does get through and it is opened, respond with a stop or opt out message. Always check the privacy policies of any place that asks for a phone number. If they will sell or share information, reconsider whether this is a good place to provide with sensitive information. Every mobile phone user should take steps to educate themselves about the text message spam laws. Then also follow this up by taking steps to protect privacy and really take these issues seriously. If any text message spam is received, consider filing complaints with the FCC and other governmental agencies. Be active in online forums and spreading the word about these (and other privacy) issues. The name of the game is creating awareness faster than the spammers can expand their act. Have you received an SMS or text spam message or been unfairly charged for a phone service?